This is the first part of in a two-part discussion about my visit to The Shrimp Farm Market in Okemos. 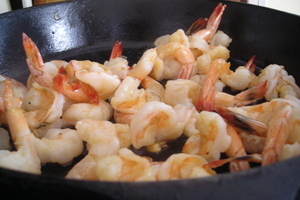 Today I am going to focus on two ways shrimp are grown for consumption: farmed and trawled. According to the National Marine Fisheries Service, American consumption of shrimp has nearly doubled since 1996 to more than four pounds a person (nearly 25 percent of the total fish and shellfish we eat a year are shrimp). The United States is the largest importer of shrimp in the world; we import over one and a half billion pounds of shrimp to a tune of $4 billion a year. That shrimp is either farmed or trawled (raked from the ocean floor). I recently had the opportunity to talk to Russ Allen of The Shrimp Farm Market, a longtime veteran and expert in the world of shrimp, at his indoor shrimp farming facility in Okemos. The smell of the building immediately pulled me back to sixth grade science class, with crayfish tanks redolent along the windows. I mention this to Allen as he walks in front of me towards his office, and his voice smiles back to me, "I guess in some ways this is what this is - a big biology class." To continue that conceit, Allen has spent 30 years in the shrimp farming classroom: setting up new farming areas, innovating, improving and always pushing for a better process. It all began in Ecuador. A graduate of the University of Michigan Fishery program, Allen left the States and traveled to the Galapagos to run a boat for tourists. After a few years he decided to join two fellow Americans in the infant shrimp farming industry. "I went and worked for free with one of the guys who was running the processing plant. We grew about 100,000 lbs of shrimp that year, in the late 70s maybe? The industry started to grow incredibly rapidly; there was a lot of World Bank, USAID money available to make it grow." "Our goal was that we had always considered shrimp trawling to be one of the most environmentally damaging ways of fishing, period. Therefore, we had assumed that shrimp farming was a potentially better environmental alternative." Shrimp trawling involves pulling a cone shaped net along the bottom of the ocean floor, collecting everything into that net. According to the Food & Agriculture Organization of the United Nations, “as many species of shrimp stay close to the bottom, good bottom contact with the ground gear is a requirement for efficient capture.â€ Fishermen can put weights on the trawls to scrape the ocean floor to a depth of 800 meters. Tim Redmond of Blue Horizon Organic Seafood Co. spoke to me about the effects of trawling to the benthos (the organisms that thrive along the seabed, or the benthic zone). "The environmental side of trawling has long-term effects; it can take decades to replace what is lost when the bottom is raked. The balance of the ecosystem takes years to rebuild." Redmond spoke to me about the bycatch, a term that indicates the amount of other life that is pulled up with the trawls. "Typically it is an 8 to 1 or an 10 to 1 venture." For every one pound of shrimp, eight pounds of other marine life is pulled up as well. The eight pounds of bycatch is often dead or dying when it is thrown back into the sea. There are methods that reduce the bycatch ratio, specifically the Bycatch Reduction Device (BRD) and the Turtle Excluder Device. According to Redmond, the Georgia fishery that utilizes such methods has reduced bycatch to 5 to 1. One pound of shrimp harvested for every five pounds of dead fish: Easy to see why Allen felt that farming might be a better alternative. However, shrimp farming, as Allen readily admits, "has taken a lot of flak from the environmentalists. Not to say that there weren't problems, there were problems - like any industry anywhere, there are problem kids, there are problem people and there are problem shrimp farms." Shrimp farming has been attacked for two reasons. Farms are located in ecologically sensitive mangrove forests and estuaries along the coastal areas. In 2006, the main suppliers of shrimp to the global marketplace were the developing economies of Thailand, China, Indonesia, India and Ecuador. The second concern arises from the waste. Shrimp and their larvae need water. When the shrimp are harvested, the water is often dumped. The wastewater often contains salt (the shrimp require ocean conditions), fertilizers (to grow the plankton more quickly to feed the shrimp), antibiotics (for the crowded conditions of the shrimp in the ponds) and pesticides (to kill unwelcome additions). Captive shrimp suffer from a variety of viruses and, overall, do not have the strength of wild food. However, as Redmond points out, "the capacity of the oceans and the waters of the world to feed protein to the growing number of people in the world is getting to the tipping point." That fact was what encouraged Allen, when he and his family moved back to Michigan in the early 1990s, to switch from developing a shrimp farming industry in Belize to develop a way to "farm shrimp that was environmentally friendly and biologically secure." Stay tuned tomorrow for a tour of The Shrimp Farm Market and Allen's vision to create a shrimp industry in Michigan.